January 29, 2018 – Our time machine heads south to the other land down under for a chilly Jazz Age adventure. Our guide on this journey is Laurie Gwen Shapiro who brings us the story of a scrappy Polish-American kid from Manhattan’s Lower East Side, who explores the Roaring ’20s final frontier. 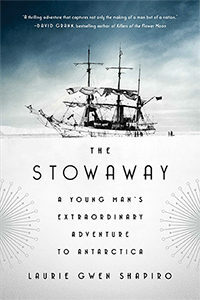 Her book is The Stowaway: A Young Man’s Extraordinary Adventure to Antarctica . It’s the spectacular, true story of Billy Gawronski who snuck onto the flagship of famed explorer Richard E. Byrd, demanding a place among the crew and on the pages of history. Laurie Gwen Shapiro is a native of Billy Gawronski’s corner of Manhattan, and you’ve seen her writing in New York Magazine, Slate, Los Angeles Review of Books, as well as in her history column The Forward, focusing on unsung heroes. She is also a documentary filmmaker who won an Independent Spirit Award for directing IFC’s Keep the River on Your Right: A Modern Cannibal Tale and an Emmy nomination for producing HBO’s Finishing Heaven. Visit her online at LaurieGwenShapiro.com, follow her @LaurieStories on Twitter and Instagram, or toss a like to Facebook.com/LaurieGwenShapiro.